A new approach for increasing the effective resolution of not well-resolved Essential Ocean Variables has been published and selected for the front cover of the November issue in IEEE Transactions on Geoscience and Remote Sensing. This journal publishes the results of a study undertaken by researchers from SOCIB, the Laboratoire d’Etudes en Géophysique et Océanographie Spatiales (LEGOS, France), the Interdisciplinary Center for Scientific Computing (IWR, Germany) and the Institut National de Recherche en Informatique et en Automatique (INRIA, France). High atmospheric CO2 levels are leading to ocean acidification of the ocean with severe consequences on marine ecosystems. Currently the lack of measurements at high resolution of fluxes of CO2 at the air-sea interface and/or of oceanic partial pressure of CO2 (pCO2) prevents an accurate estimation of the ocean contribution to the global CO2 balance, and therefore a detailed study of the mechanisms involved in the ocean-atmosphere interactions of CO2. In this regard, alternative approaches for inferring the fluxes at high resolution from satellite imagery are needed. In this study, other Essential Ocean Variables, which have been measured at high resolution and that share common structure features with pCO2, i.e. Sea Surface Temperature (SST) and Chlorophyll a concentration (Chl), have been used through a new methodology to improve the spatial and temporal quantification of oceanic pCO2. 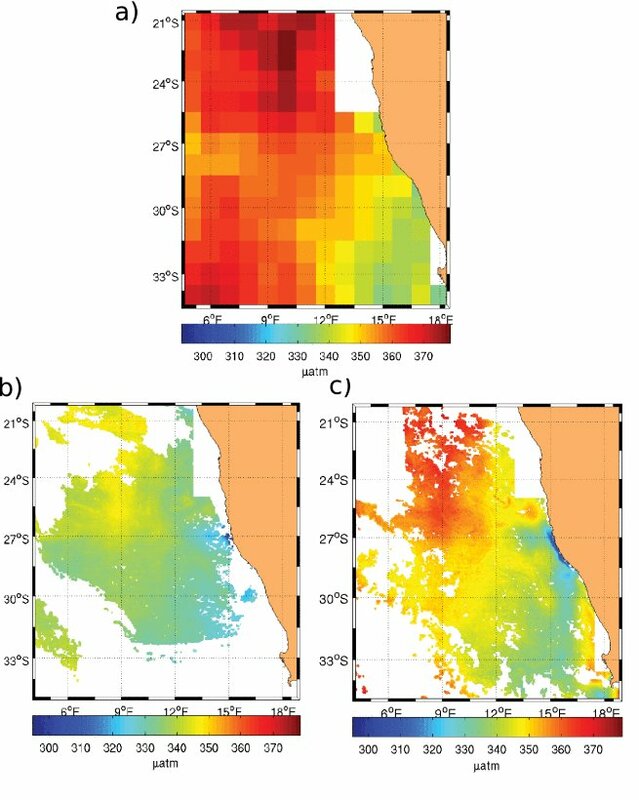 In short, the resulting finer resolution maps of oceanic pCO2 (Figure 1b and c) are obtained analyzing how the information transfer is propagated across scales over the datasets, and incorporating the small scale common features of the well observed high-resolution variables (i.e., SST and Chl) into the not well resolved and coarser one (i.e. oceanic pCO2, see Figure 1a). Figure 1. Maps of pCO2 (in µatm) in the South East Atlantic ocean corresponding to a) Monthly values for September using a monthly climatological product at 100 km of spatial resolution constructed interpolating in space and time the measurements of surface water pCO2 available in this region (which is referred to as C-Takahashi). b) Daily values at ~4 km of spatial resolution inferred from a newly developed method applied to the monthly low resolution map shown in a) and daily high resolution (∼ 4 km) satellite maps of Sea Surface Temperature (SST) and chlorophyll concentration (Chl) for September 21; c) the same as b) but for September 30, 2008. This methodology has been applied to monthly maps of oceanic pCO2 at 100 km of spatial resolution (which is constructed interpolating all the available in-situ measurements) and daily high resolution (~4 km) satellite maps of sea surface temperature and chlorophyll a concentration in the South East Atlantic ocean. Outputs of this algorithm have been compared with in-situ measurements, showing in average an improvement of about 4% as compared to the original coarser monthly maps. Furthermore values of oceanic pCO2 have been improved in points close to the coast with respect to the original input data. This is a very promising result and opens up new possibilities for the inference of other key variables related to global warming, for instance DMS (dimethylsulfide), which is only available presently as monthly products.